Have to post this again because it’s just too good not to. 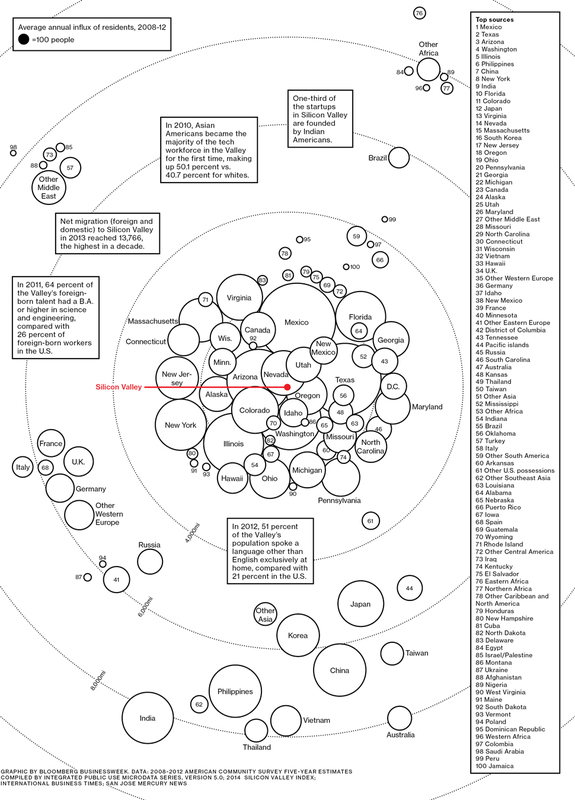 A graphic illustration from BusinessWeek showing who’s coming to Silicon Valley. One third of Silicon Valley startups are founded by Indian-Americans. As of 2010, Asian-Americans are the majority of Silicon Valley tech workforce: 50% vs 40% for Caucasians. Possibly eye-opening sources of talent in quantity: Japan, Middle East, Vietnam, France, Pacific Islands, Africa, Caribbean. Silicon Valley is a powerful successful example of the “melting pot” theory: ignore origin and ethnicity, come together to do big things. It’s why we must continue to push to expand access/openness/inclusion to all origins/ethnicities/genders/religions: there are huge opportunities ahead. @pmarca Must include non-degree standard educated too. Many creatives eschew further education to pursue their dreams, and achieve it. @pmarca There's some kind of filter at the educational level that needs attention too if this is going to happen. @pmarca 2/2 Douglas Adams said it best: "I'd take the awe of understanding over the awe of ignorance any day." Could this be because India made a conscious decision to promote education tailored to the needs of tech? Now that’s my idea of visionary democratic government. China is doing much the same thing. Will Silicon Valley even exist in 50 years, or will it relocate to China taking the design and marketing to the manufacturing hub. That’s a scary thought.